A book that will soon be in stores called "Becoming Steve Jobs," offers some new revelations about the late Apple co-founder who succumbed to pancreatic cancer in 2011. Co-written by Brent Schlender and Rick Tetzeli, a portion of the book was posted on Amazon's "Look Inside the Book" before being removed. While the preview is no longer available online, some interesting information from the book has been revealed. Perhaps the most interesting part of the book that leaked, dealt with the time that Tim Cook discovered that his blood type matched Steve Jobs' blood type. Both happened to have a rare type of the stuff circulating throughout their bodies. Cook had some tests done at a hospital and found that he was in good health. So he approached Jobs to offer him part of his liver. The Apple co-founder, who was in dire need of a new liver at the time, flat out refused the offer. Another interesting passage discussed a possible acquisition of Yahoo that was being discussed by Jobs and his counterpart at Disney, Bob Iger. It is interesting to consider what Apple might have done with the myriad of patents and internet-related properties owned by Yahoo. 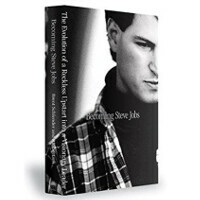 If you're interested in "Becoming Steve Jobs," (the book, not a transformation) it can be pre-ordered from Amazon.com or from iTunes. By the way, the sub-title is "The Evolution of a Reckless Upstart into a Visionary Leader," which gives you an idea of what the book focuses on. You can both dislike Apple's business practices, or Steve Jobs approach; and have the decency to respect the man as a human being. The disrespect is totally uncalled for, and generally speaking we all have an unspoken rule in which we do not speak ill of the dead. Observing that doesn't make you a fanboy, it makes you a fully formed person. Respect dude, it never hurts to have it. We could use much more in our society. This is all a misquote. Tim said "Steve, would you like half of my liver?" And Steve said "No, I'm full. The veal pamesean was plenty." Oh, wait, wasn't Jobs a vegan? Dangit, I screwed my own joke up. I don't know about vegan, but I know he wasn't above doing acid in his younger years. i wonder what makes people so utterly stupid, they become bitter. Get a job, make yourselfs useful. Is Tim Cook a presidential candidate? "Perhaps the most interesting part of the book that leaked, dealt with the time that Tim Cook discovered that his blood type matched Steve Jobs' blood type." -PA (Alan F.) Why, is, there, a, comma, in, your, sentence? What, is, your, infatuation, with, the, comma? Do, you, actually, know, its, purpose? Why, do, you, like, it, so, much? Agreed with the post. Respect the dead person.!!!! I respect the dead who deserve to be respected. Hitler is dead and universally hated. I hate Steve Jobs. I stand by my original post. I think Jobs was a terrible person and was a detriment to the phone industry and the American economy. The dead get criticized every day. It's called history. I don't appreciate being censored. This is actually a misunderstanding. Tim Cook offered to let Steve Jobs take a look at his liver, and Jobs believed that meant he could have it. STEVE JOBS ISN'T DEAD........ They faked his death so they could release a phone with a larger screen cause Steve Jobs didn't want to appear as though he was as admitting he was wrong. How's about that for a conspiracy theory? Or Tim offered him half his liver but Steve wanted the whole thing.